The Samsung Galaxy Note series is one of the best smartphone ranges out there. It's the series that made so-called 'phablets' fashionable (indeed, no one even bothers to call them phablets any more) and brought with it integrated stylus control. There was a blip in the Note's career with the Galaxy Note 7 – yes, the one that could have self combusted, hence being recalled in its entirety - resulting in the Note 8 having to work that little bit harder to regain the trust of devoted Note fans. The Note 9 steps things up yet again, re-confirming what the Note series is all about: top specs, reliability and that stylus control. The only problem is it comes with one hefty price tag. Is it really worth its £900 asking price? Samsung has been an advocate of a metal core with a curved glass front and back design for a while now. It works brilliantly so there's been no reason to take a different path. Therefore, the Note 9 is an evolution of the Note 8 and a clear relative of the Galaxy S9 and S9+. Read that as "it's not massively different this year". 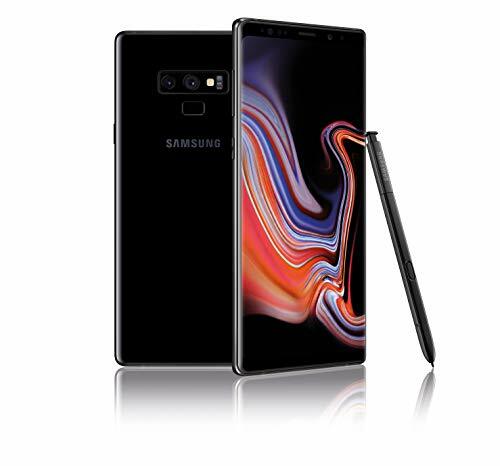 The Note 9 remains the largest Galaxy model, though only just, incorporating a 6.4-inch Infinity Display with minimal "forehead and chin" bezel, squeezing the speaker, iris sensor and camera to the top, and ditching any branding towards the bottom. It's no small device, but despite its 76mm width it's still easy to grip one-handed, even more so than its predecessor thanks to the new slightly tapered edges. The Note 8 was a little squarer than the Galaxy S8 and S8+, with more standard colour options. While the Note 9 retains a slightly stockier look compared to the S9 and S9+, it has upped its game in the colour department. The Ocean Blue with yellow S Pen and Lavender Purple with matching S Pen options are fabulous, certainly more exciting than standard black (which is also available). Samsung Galaxy Note 9 vs Galaxy S9+: What's the difference? Improvements have been made to the rear of the Note 9 too, with a repositioned fingerprint sensor, following in the footsteps of the S9 and S9+. This sensor now sits below the dual camera arrangement, which doesn't look as neat and tidy, but is far more ergonomic in use. The Note 9 retains the 3.5mm headphone jack, being one of the few flagship smartphones to do so. The integrated S Pen is what separates the Note from the S9+, bringing a bunch of new features that we'll get into later. Both Note and S Pen are IP68 water and dust resistant, so you can use them in the rain or the shower without any worries whether or not the stylus is in its holder. Although the newly positioned fingerprint sensor is fast in response, we often found ourselves defaulting to the iris and face scanning biometric option for logging into the device. Samsung has combined these measures in the Note 9, as it did in the S9 and S9+, calling it Intelligent Scan. Intelligent Scan works well in a range of conditions, including the dark (although you need to first register in good light), allowing you to simply look at your phone and have it unlock, though it does require you to hold your phone more upright than Apple's Face ID on the iPhone X. This occasionally caused a little frustration, and some might find the fingerprint scanner a preferable option, especially when getting the Note out of a pocket. Certainly, if you have larger hands then tapping that scanner is now a lot more natural than the Note 8. Switching from long-term Note 8 use to the Note 9, we found ourselves able to unlock it first time every time with the new fingerprint scanner. The Galaxy Note has always been about a big display. It used to be the thing it did so much better than other smartphones back when big displays weren't the norm. Thankfully Samsung hasn't dropped the ball on the big screen front, despite the Note no longer monopolising this market. The Note 9 sports a 6.4-inch AMOLED panel with an 18.5:9 aspect ratio and a Quad HD+ resolution. The eagle-eyed among you will notice the size is 0.1-inches larger than the Note 8, not that you'll really notice, while the ratio and resolution remains the same. Like the S9+, the Note defaults to a Full HD+ resolution (2220 x 1080) in order to save battery. Generally we didn't feel the need to make the jump to Quad HD+ for everyday use. You might find it's worthwhile when watching specific content, but on the whole Full HD+ is as much as you'll need unless you have a magnifying glass to analyse those extra pixels per inch. Mobile HDR Premium is on board too, which means a brighter and more dynamic display than your average, which is brilliant when watching compatible Netflix or Amazon content. You'll also find a video enhancer mode in the settings which is worth turning on for that extra burst of HDR excellence, although it can sometimes lift darker scenes a little too much for our liking. Overall, the Note 9's display is fantastic: colours are punchy and vibrant, blacks are deep and the contrast is excellent. As the Note 9's display isn't as curved at the edges as the S9 and S9+ it's perhaps a little less striking from afar, but more practical in use as the flatter design is better when using the S Pen stylus – trust us, you wouldn't want it curvier. Practicality and performance go hand-in-hand and the Note 9 offers both in abundance. Under its hood you'll find either the Qualcomm Snapdragon 845 or Samsung's own Exynos 9810 (as reviewed here), depending on which region you live in. The UK gets Exynos, while US gets Qualcomm, not that it should matter, as both deliver plenty of power. In terms of RAM and storage, there are two Note 9 models: the first offers 6GB of RAM and 128GB of storage; the second has 8GB of RAM and 512GB storage. Both have microSD support for storage expansion up to 512GB, which means the 8GB model is 1TB ready. We have zero complaints about the Note 9's performance. Everything is slick in operation, from software to apps, while the 4000mAh battery under its hood means that even power users will struggle to deplete it in a working day. We have yet to end a day on less than 15/20 per cent, even putting it through its paces. We've even got through a weekend without a charge (in light use), a testament to that 4000mAh battery. It is worth remembering we have opted for Full HD+ resolution for everyday usage though. Switch up to Quad HD+, spend half a day fiddling with super slow-motion video and you'll likely hit the red before the day is out. Then there's how aggressively the Note 9 boosts the display brightness in sunny conditions - if you're using the phone outside a lot in summer, the display will eat battery a lot faster. Both Quick Charge and wireless charging are supported, so even if you do manage to drain the Note 9's battery, you'll be able to top it up rapidly. There are AKG-tuned stereo speakers - the same as the ones you'll find on the Galaxy S9 and S9+ - which are loud, clear and an absolute delight. When we first heard them on the S9+, we said they could rival HTC BoomSound speakers, and the same is true in the Note. It's also worth mentioning that they can be boosted with Dolby Atmos for a wider and more articulated sound. It's a software-based system and it isn't the same Atmos experience as what you'd get with a 5.1.2 channel home cinema system, but it's a good enough enhancement. The 3.5mm headphone socket provides conventionality - with a range of tuning options outside of Atmos - and there are most sophisticated audio options, like the ability to split the Bluetooth connection, so that Spotify music (for example) would play through a speaker and other notification and system sounds remain on the phone. It's very clever. Additionally on the hardware front, Samsung's Note 9 can also now connect to a desktop PC with just a USB Type-C to HDMI connector, rather than requiring Samsung's DeX so you'll be able to mirror your Note's display on your desktop far more easily - ideal for using with the S Pen's key new skill. It's the S Pen that differentiates the Note from the Galaxy S devices. This integrated stylus offers superb functionality and is the main reason the Note series has always been so practical. But this time around, largely thanks to Bluetooth, the S Pen offers more than ever before. The S Pen is now Bluetooth LE-enabled, with its own battery integrated, which is charged through the Note 9 in under a minute. This Bluetooth connectivity means the S Pen is no longer just for writing and drawing, but can act as a remote control too. This adds features, including taking selfies and group pictures, pausing and playing music and presenting slides. There is some third-party support, including Spotify, though hopefully more will be added in the future as it's certainly not reached its full potential yet. Beyond that the S Pen remains a delight to use. It' great for writing, with the screen-off memo feature providing instant handwritten note taking, and it provided versatility in selecting and manipulating content. You might look at the Note and think you don't need a stylus and you could be right - without it you get a flagship smartphone experience. But embrace the S Pen and you'll find the Note elevates itself to tackle tasks you might never have considered on a phone. The camera on any flagship smartphone these days is an essential part to get right, because competition is fierce. Yes, Huawei P20 Pro, we're looking at you. The Note 9 takes no chances in this department though, bringing the fantastic camera setup from the S9+ and adding a few extra features such as Scene Optimiser and Flaw Detection. The main camera features a 12-megapixel Super Speed Dual Pixel sensor with autofocus and a dual aperture of f/1.5 and f/2.4 (it automatically selects which, unless in manual mode), while the secondary telephoto camera is also 12-megapixels with an f/2.4 aperture. Both offer optical image stabilisation and the results are excellent, especially in low-light conditions. You'll get some outstanding shots in dark conditions on the Note 9 thanks to this wide aperture setup, plus adept processing, which delivers less image noise than you'll find on many other devices, including the iPhone X. In daylight conditions, the Note 9's rear cameras continue to perform, though the differences between, say, the Note 9 and the iPhone X aren't as obvious as they are in low-light conditions. The new camera features come in handy too. Scene Optimiser uses artificial intelligence (AI) to determine what you are taking a picture of and adjusts the settings accordingly. There are roughly 20 scene settings, including portraits, animals and food, and the Note 9 is very quick to identify if your subject fits into a category, presenting a small logo above the shutter button on the preview image to let you know what it thinks you are capturing. Essentially, this is what LG is calling AI Cam and Huawei is calling AI Camera. Samsung isn't as overt with the AI branding and we like the subtle indication that it's detected the scene and adjusted. Flaw Detection does exactly what it says on the tin: once you've taken a shot, it will bring up a speech bubble if it thinks there's something wrong with the shot. For example, if it detects blurriness, someone blinking or a smudged camera lens, it will tell you so you can take another shot before you lose the opportunity. It also works on selfies. The Note 9 also has super slow-motion 960fps video with motion detection. Just as with the S9+, this requires good light for worthwhile results. The automatic motion detection feature allows you to position a yellow box where you want to capture the action, but you have to hold the phone very steady and it's quite fiddly to use. AR Emoji also comes to the Note series in the Note 9, but we let you decide whether that's a good thing or a bad thing. The Samsung Galaxy Note 9 launches on Android Oreo 8.1 with the re-branded Samsung Experience UX 9 over the top (previously known as TouchWiz). Samsung's re-working of Android is still one of most aggressive, but it's also accomplished and much better than the likes of Huawei's EMUI in terms of usability. You get a lot of choice with Experience UX, from how you want your navigation bar, to what you want the always-on display to show. There are some great additions, and some unnecessary ones too, with Samsung pretty much offering an alternative for any service Google offers within its own app store. You'll find the likes of Samsung Connect for managing your connected devices, SmartThings hub for Samsung's answer to Google Assistant's smart home skills, and then there's Bixby, Samsung's equivalent of Google Assistant. You also get Google Assistant, so as we said there's plenty of choice. Bixby 2.0 launches on the Note 9, bringing several improvements to the personal assistant. However, it's still not our favourite. The dedicated physical Bixby button can't be used for anything other than Bixby launching, which is just annoying. It's not even possible to turn it off altogether, meaning you'll often find yourself with the Bixby screen appearing on your device after an accidental knock of that button. It's the S Pen that will be the biggest consideration when deciding if the Note 9 is the device for you though. Ultimately this is what primarily differentiates the Note 9 from S9+. If the S Pen's writing, drawing, notation and Bluetooth remote features doesn't excite you all that much, you'll get almost everything else the Note 9 offers in the S9+, expect the battery life. The other big consideration is price. The Note 9 is expensive - very expensive, really - but it offers an experience like no other. Besides, the iPhone X is just as much without as rich a feature base, and we'd still recommend that to the right user. Those with a Note 8 in their pocket probably don't need to rush out for an upgrade though. It's an experience that's close the the outgoing phone, the battery and S Pen boost being the big changes. The ultimate sense with the Note 9 is that it's a superb Android phone that we'd recommend in a heartbeat, but it's a case of evolution rather than revolution. The S9+ offers nearly all the features the Note 9 does, but on a smaller battery capacity and without the Bluetooth-enabled S Pen stylus. You'll still get a brilliant design, fabulous screen, excellent speakers, and great camera results, but in a slightly smaller and more affordable package. Huawei's P20 Pro is £100 less than the Note 9, while also offering a stunning design, excellent battery life, a camera that is best-in-class, impressive sound quality, and all the power and performance you'll need. It doesn't have an S Pen, the Face Unlock isn't as good as Samsung's Intelligent Scan, but the P20 Pro is still a worthy alternative to consider. Samsung didn't change all that much in the Note 9, especially in terms of design, so if the Note is the series for you but you want to spend a little less, then consider the Note 8. The S Pen isn't Bluetooth-enabled so you lose remote functionality and the battery isn't as long-lasting, but that's the main difference.